In this release, we have introduced new features and enhancements to improve overall productivity. We have introduced a better user experience while configuring your company’s Single Sign-On preferences via 8x8, SAML, or Google. In the Identity Management page, find the supported authentication options right at the top of the page. 8x8 Username and Password is selected by default. Select a provider and the relevant information is presented to you for further configuration. For details, see our content on Identity Management. For details, see our content on setting up Single Sign-On. Editing List Items is Now Simpler! Wish to edit a user, queue, ring group, and more? Simply navigate to the desired page from the main menu. Click the next to the desired item to view the individual record in edit mode. While configuring line keys for Cisco devices that support a single line key, we have introduced minor usability enhancements. By default, you have only one line appearance key supporting four concurrent calls. The + line appearance button is hidden for Cisco devices, you cannot add or delete any line appearance keys. For details, see our content on Set up Line Appearance Keys. Adding personal phone numbers to company contacts now supports numbers entered in any format. This number shows up as the mobile number for end users in the Virtual Office desktop app. 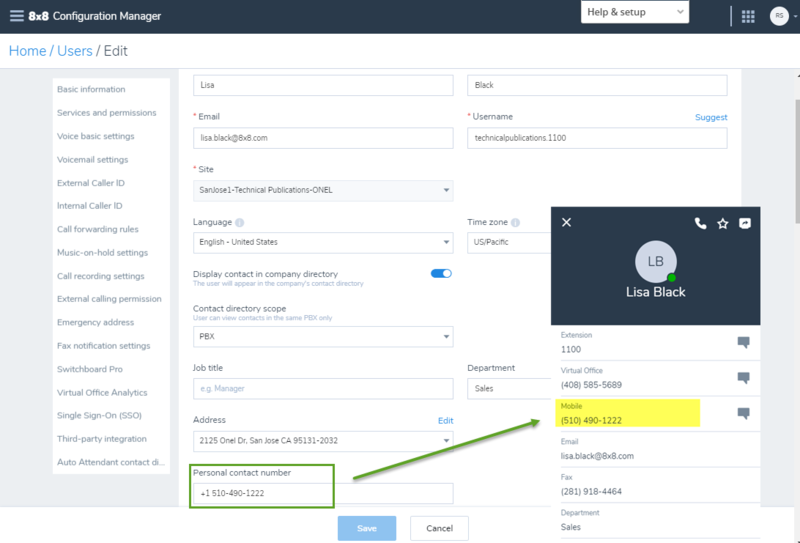 To add the personal number in VO-Configuration Manager, while editing a user profile, enter your phone number in Personal contact number field and save. For details, see our FAQ content on how to add a mobile number. With the improved performance, you can now access data in Configuration Manager quickly. Prior to this release, while accessing the individual account settings from Virtual Office Desktop, users encountered errors on IE11. It is now resolved. You can now search and filter different entities such as users, phone numbers, and sites, for easy and quick access. The search results will be saved even if you navigate away from the search screen. Let’s say you searched users with first name ‘John’, the resulted list will be saved until you clear the search entry. To search users, go to Home > Users and enter a search entry. Press Enter on your keyboard to see the results. To go back to the complete list, clear the search entry and press Enter again on your keyboard. For details, see our content on searching users. You can now find the incorrect fields quickly while editing a user's properties. Before you save a user, you are navigated to the section that requires a valid value. Enter the correct value and save. This feature helps you save time searching for the properties that need to be corrected. To create a new user, go to Home > Users , and click Create User. Make the necessary changes and Save. If there is any incorrect data, you are taken to the field. For details, see our content on set up Virtual Office users. Zero dial out now defaults to site receptionist if you have set up one. 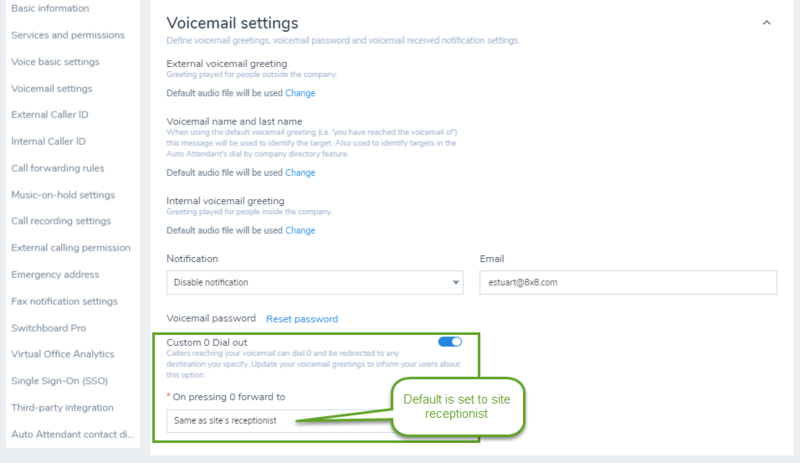 When setting up voicemail settings for a user, site receptionist option becomes the default for custom zero dial out. To access custom zero dial out, open a user profile and go to Voicemail settings. Click to enable custom 0 Dial out. For details, see our content on how to redirect callers from voicemail by dialing zero. For details on how to set up a site and site receptionist, see our content on Set up Sites. You can now view user's contact address, and external caller ID name, when you generate a user report. You can quickly find users information, audit, and verify them. To generate the report, go to Home > Users and click Generate users report. For details, see our content on how to generate user reports. We have now improved system performance when gathering the porting request information. For details, see our content on how to port your phone numbers. 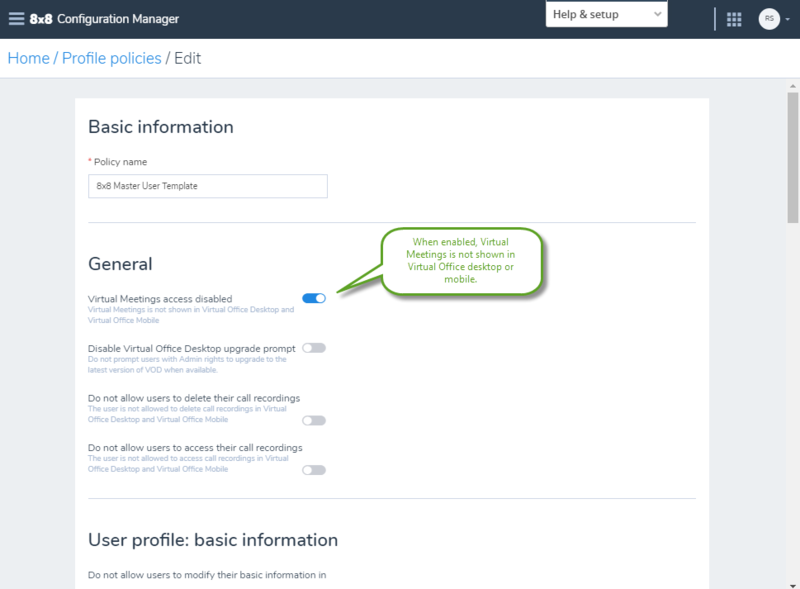 Note: The Virtual Office desktop app users can also benefit from the improved navigation on the Account Settings page. 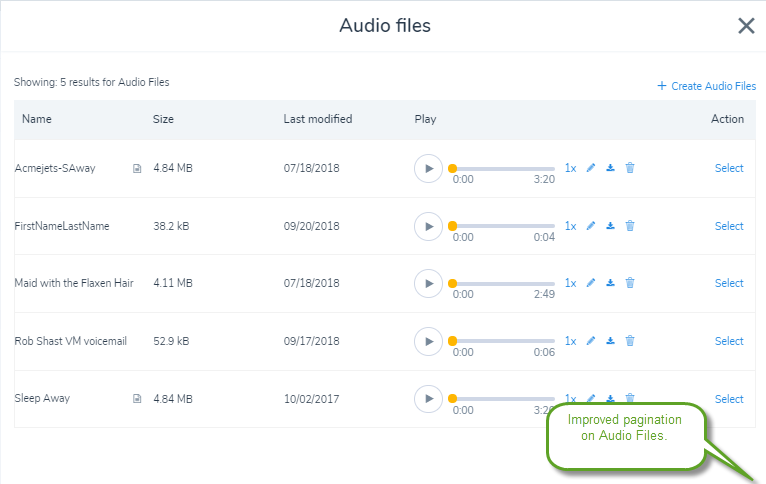 Whether you want to update a voicemail greeting for a user or upload a new audio file for hold music, you can manage all the audio files from a centralized location. From the main menu, go to Audio Files, then view the list of uploaded audio files, search, play, delete, and more. For details, see our content on Manage audio files library. You can now set up separate voicemail greetings for external and internal callers in ring groups and call queues. 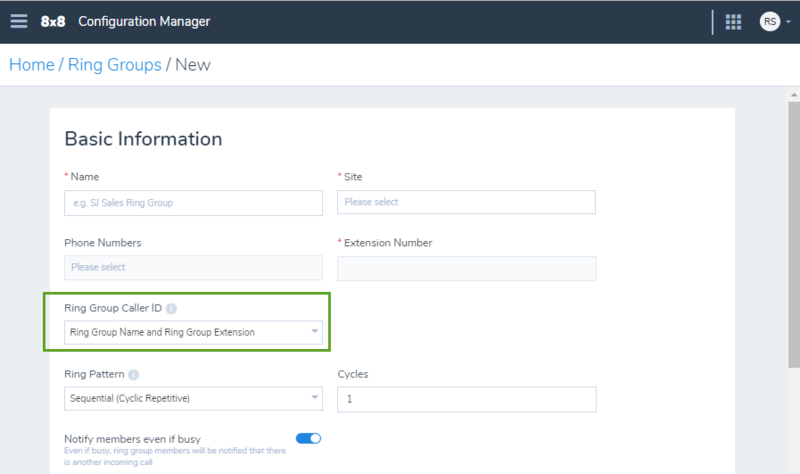 Simply edit an existing ring group or call queue and change the voicemail settings for external and internal voicemail greetings. To access ring group's voicemail greetings, go to Home > Ring Groups > Edit > Voicemail settings. For details, see our content on ring groups voicemail settings. To access call queue's voicemail greetings, go to Home > Call Queues > Edit > Voicemail settings. 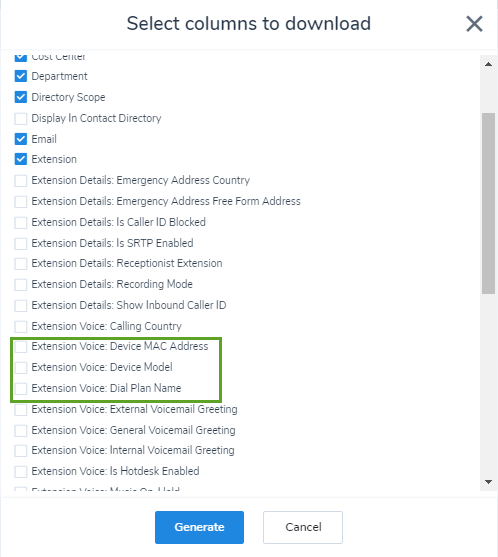 For details, see our content on call queues voicemail settings. With improved access to the user device information, you can now select a user record from the user list and view the device model that the user is assigned to along with the activation status, Mac ID, and device admin password. For details, see our content on Select a device. 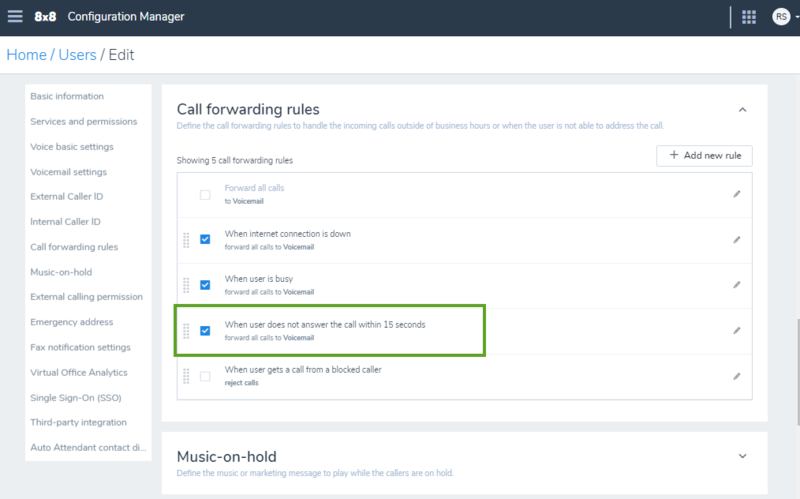 While defining call forwarding rules, we now specify the duration for forwarding calls. When a user does not answer a call for 15 seconds (approximately three rings), the rule triggers the call to be forwarded. You can set this duration as desired. For details, see our content on define call forwarding rules. Improved description in the Auto Attendant menu settings guides admins about the behavior when callers fail to select an option from the menu. By default the auto attendant menu replays once and further failure of action from callers results in a dropped call. These settings allow you to edit the number of menu replays and call routing when there is no action by callers. For details, see our content on Auto Attendant's edit settings. In the previous release 1.6, we introduced policies which allow administrators to disable Virtual Office Meetings, access to call recordings, and the ability to update Virtual Office desktop app at the user level. These policies are now renamed from User Policies to Profile Policies. To access this feature, click Profile policies from the main menu. For details, see our content on Profile policies. 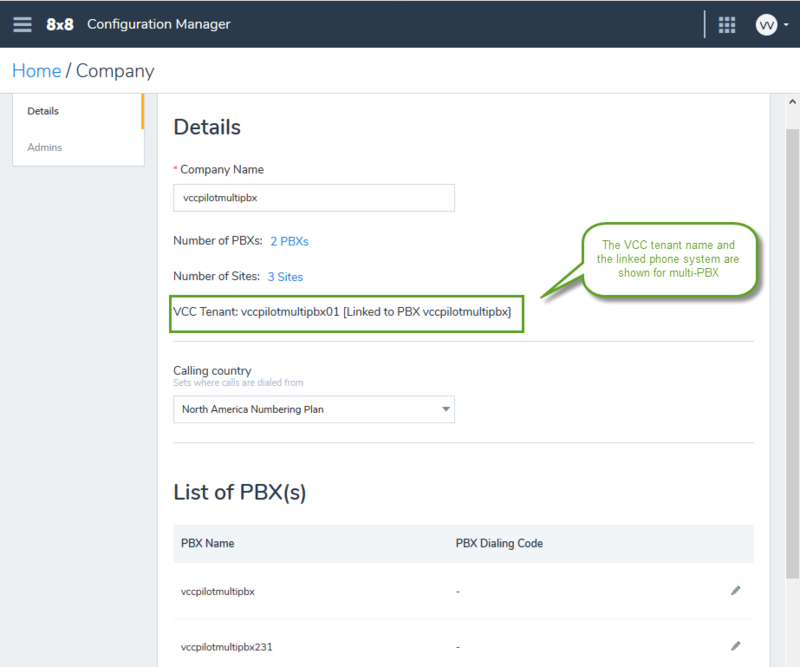 Support for VCC user configuration in a Multi-PBX environment: Phone system admins can now view the VCC tenant name and the PBX it is linked to in the Company page. This information helps them in handling the site assignments of users smoothly. When you create a site that includes VCC users, make sure the site belongs to a VCC-enabled PBX. 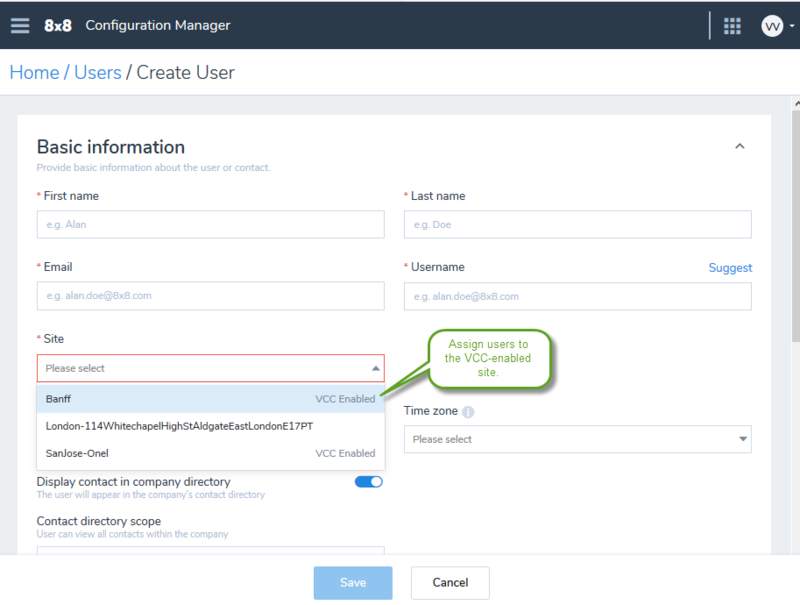 Before assigning VCC services to a user, assign the user to a site that is VCC enabled. Introducing 8x8 Profile Policy: The 8x8 Profile Policy offers the ability to restrict users from using meetings or upgrading to a recent version of the Virtual Office desktop app, accessing and deleting call recordings. With this service, you can now disable these features company wide by using a master user policy. Let's say companies with existing solutions for meetings want to disable the Virtual Office meetings app. They can edit the master user policy to disable meetings. Ability to upgrade or downgrade user license (temporarily reverted): Due to billing irregularities experienced with upgrading and downgrading user license from the Users page, this feature has been temporarily reverted. You can still work around by deleting the current license and assigning a new license. The users Info Panel now displays Services and permissions (licenses) for the user as well as the basic information and voice basic settings related to the user. Support for bulk removal of porting requests: To help with larger deployments, you can now select multiple porting requests in pre-porting and porting failed status and remove them at once. To remove pre porting or porting failed numbers, go to Home > Phone numbers, filter the numbers and click Remove porting request. Enhanced user report: User report now includes more fields such as device model, device MAC address, and switchboard access level, dial plan name, voicemail, notification email and more. To generate the users report, go to Home > Users and click Generate users report. Improved access to line key configuration: You can now access information about which users have Line Keys configured on their phone from the Device inventory page. For a quick and easy access to the Line Key configuration page, go to Home > Devices, and click View device report next to an activated device that supports Line Keys. You can edit the Line Keys from the Devices inventory page. 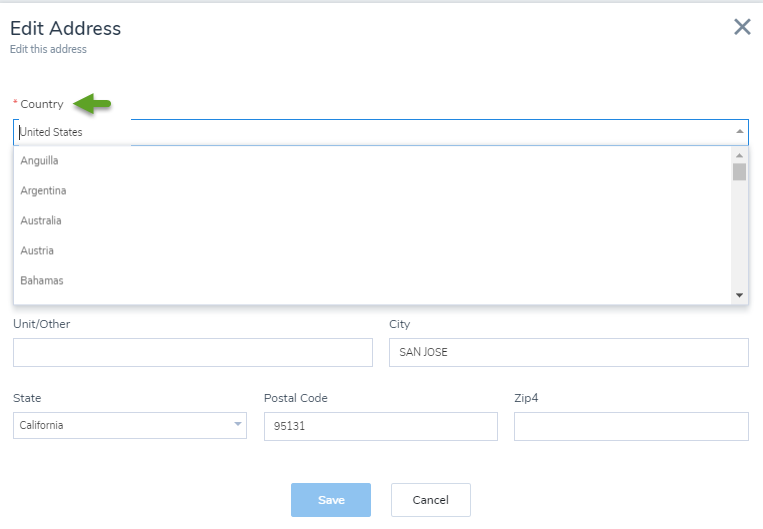 Consolidated call routing key options in target: While selecting a call routing target for an auto attendant key, the individual transfer options for extensions, call queues, auto attendants, external numbers, and ring groups are now consolidated into a single option. Go to Home > Auto Attendants > Call Handling Menus and select user, service, or external number for the call routing target. 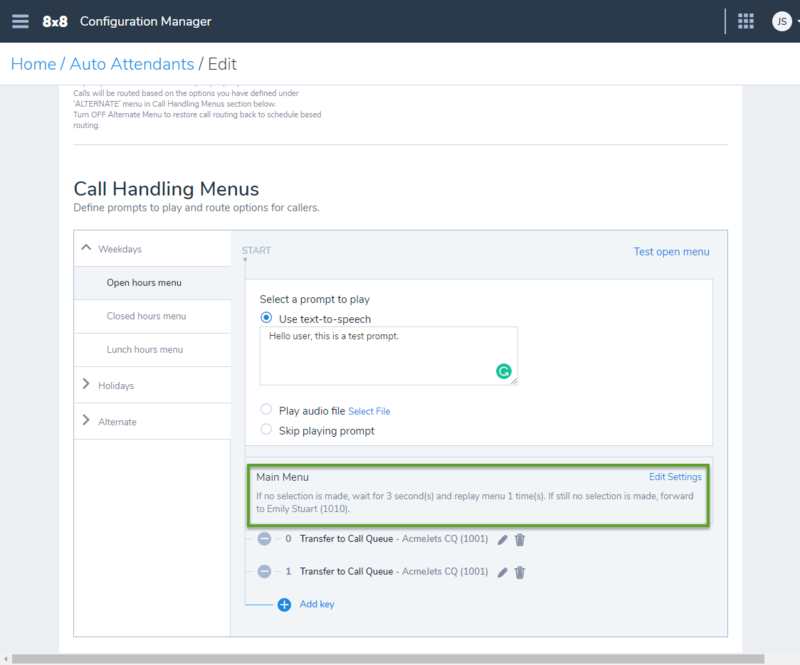 Ability to point to Auto Attendants in a different language: Within an auto attendant, you can now select to route calls to auto attendants in another language. For example, you can write: "Welcome to AcmeJets Inc. For English, press 1. For Italian, press 2." The call routing option for key 2 can now point to an Auto Attendant in Italian. Modify your prompt to inform your callers about the language choices. Go to Home > Auto Attendants > Call Handling Menus and search for your Auto Attendant in the target box. Introducing call forwarding for analog fax devices: You can now forward your faxes from an analog fax machine to another user when the fax machine is broken or not responding. To forward your faxes, you need to set up call forwarding rules for the analog fax machine. Create and save a user with the proper services and permissions for the analog fax machine and assign the analog fax device before you set up the call forwarding rules. See how to set up an analog fax machine. 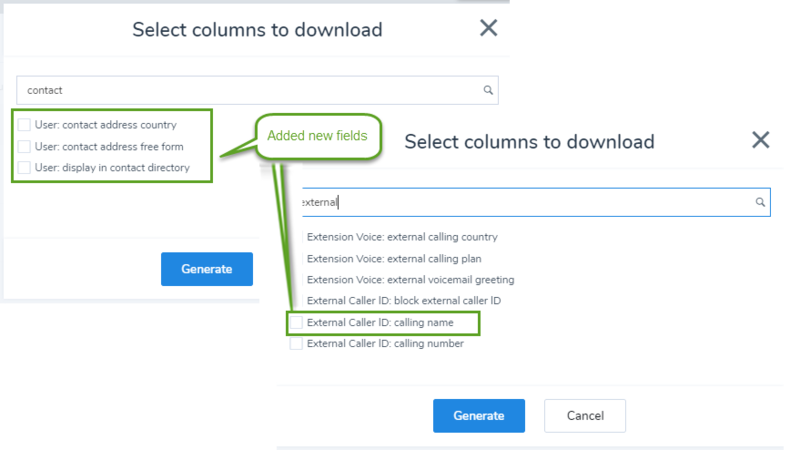 Improved pagination of call queues page: Call Queues data is now structured in collapsible sections, facilitating navigation and usability from desktop and mobile devices. 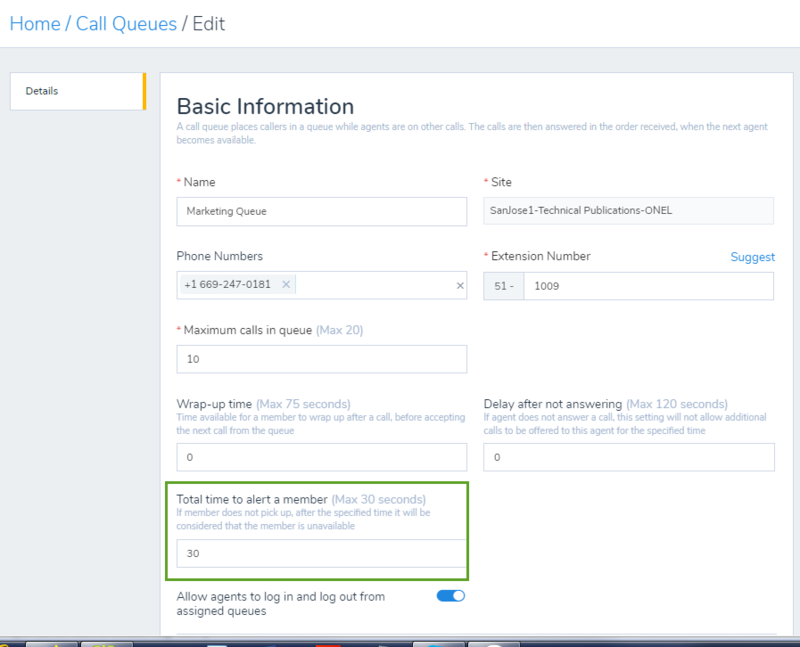 To see our new look go to Home > Call Queues > Create Call Queue and scroll down to see the collapsible sections. Pagination support for audio files: You can now navigate easier and have better visibility of the audio files. To access the audio files repository, while editing a user, go to Music-On-Hold and click Change next to the default audio file. The audio file repository can be accessed from multiple places: Users Edit page, Auto Attendants, Ring Groups, and Call Queues. See how to make changes to your audio files. Automatic notification to new admins: When you promote a user to an admin, the user receives an automatic email notification informing the granting of administrator privileges. 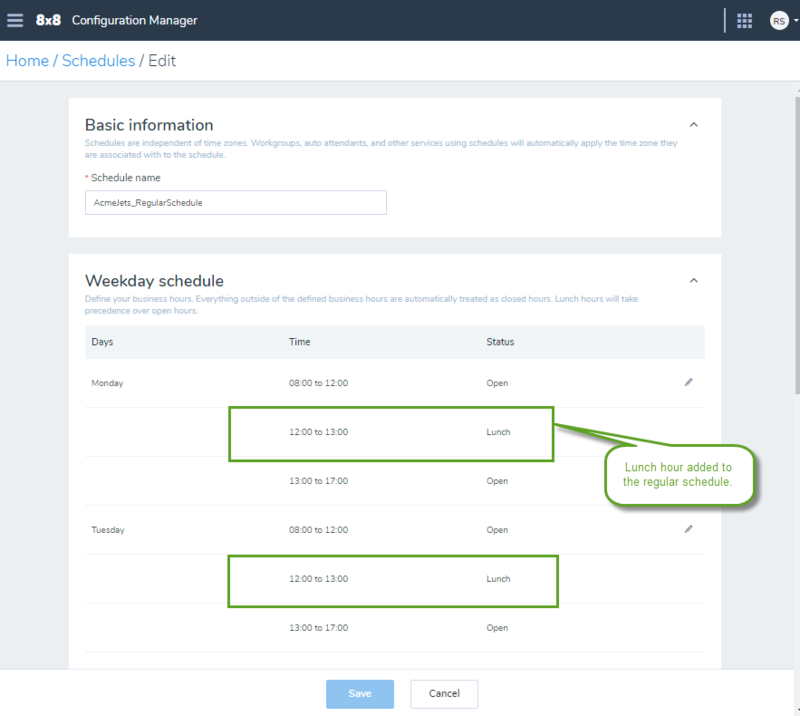 Support for lunch hours in Auto Attendant schedules: You can now define lunch intervals during your workdays, exceptions, and holidays, and design dedicated call flows for the lunch intervals. Let's say your business observes a lunch break for all employees at a specified time and would like to direct the call traffic to voicemail during that time, define a lunch break in your daily schedule and set up a call flow in the auto attendant for the lunch break. Whether your business observes multiple open hours, or multiple lunch breaks in a day, you can manage it all with 8x8 auto attendants. To define lunch hour for your business, go to Auto Attendants > Schedules and edit Weekday schedule. Repeat the procedure for weekday exceptions and holidays. See how to add a lunch hour to your auto attendant schedule. 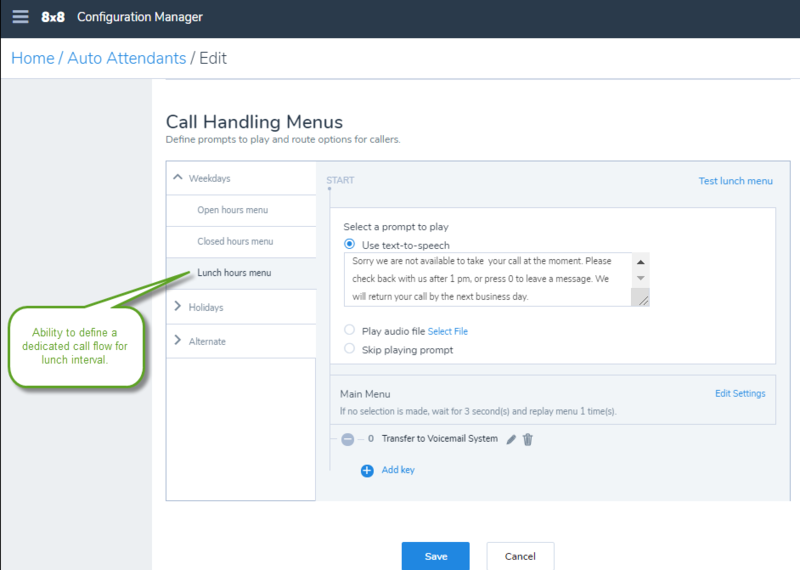 To define a dedicated call flow for the lunch interval, go to Auto Attendants > Call Handling Menus, and click to configure Lunch hours menu by defining a prompt for the callers and a key to route the calls during lunch hours. Ability to downgrade users licenses: In this release, you can downgrade a user license or change it to a license with lower capabilities. When you downgrade a user license, the shared settings among licenses, such as phone number, extension number, and call forwarding rules will be preserved. The system automatically changes the features that are not shared between the licenses such as Switchboard Pro or Virtual Office Analytics. When you downgrade a user license, for example, Virtual Office Analytics automatically changes the user's access level from Supervisor to Essentials. When you upgrade a user license, however, you still need to configure the user profile to allow the new capabilities. In the above example, you need to modify the user profile to allow Supervisor access instead of Essentials when you upgrade the license. To downgrade a license, go to Users > Services and permissions while editing a user profile. Simply select another license from the list and save the changes. See our previous release regarding the Ability to upgrade licenses via Users page. Known Issue: A limitation causes Configuration Manager to return a wrong message when saving a license downgrade for a user, suggesting saving has failed when the changes are being saved correctly. Known Issue: When changing the license, VOD and VOM may not be automatically provisioned or de-provisioned as the maximum number of participants in a meeting is different among licenses. Known Issue: The BMW administrator's membership may not be automatically transferred from a license to the other. 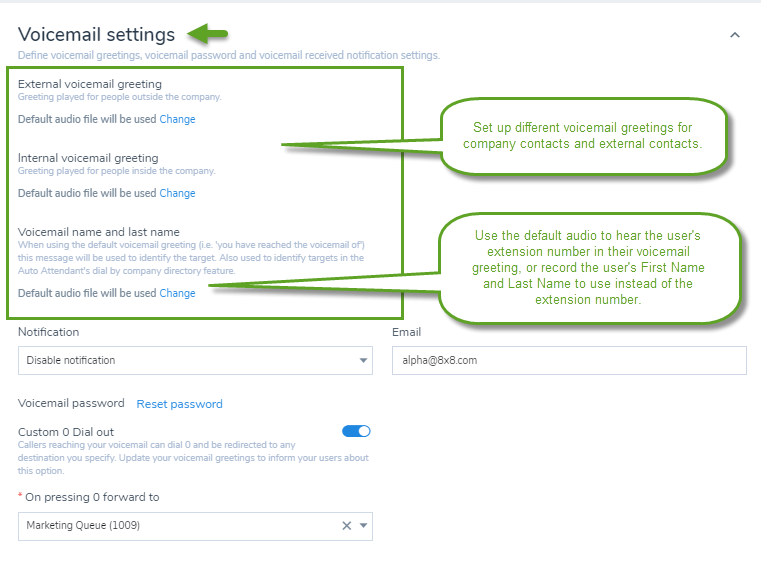 Option 1: General voicemail greeting by default contains the user's extension number, such as: "You have reached the voicemail of ... "
Option 2: General voicemail greeting contains recorded first name and last name, such as "You have reached the voicemail of [Robin Shasta]..."
This greeting is also used for auto attendant's voicemail when accessed through the company directory. To access the voicemail settings, go to Home > Users and expand Voicemail settings while editing a user. See Set up Voicemail Password and Notification. 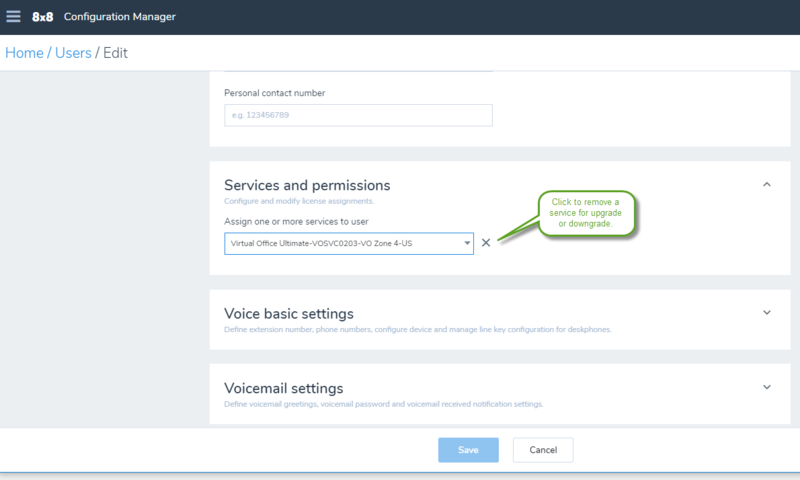 Ability to redirect callers from voicemail by dialing zero: The callers who reach users voicemail can now dial zero and be redirected to other destinations such as users, call queues, ring groups, or auto attendants. This option gives callers a chance to reach a live person or follow the auto attendant's direction to another department if their original party is not available to take their calls. To redirect the callers from voicemail, go to Users > Voicemail settings and enable Custom 0 Dial out. Select a destination from the list and save. See Custom 0 Dial Out. Ability to generate users data report: You can generate a users report including name, language, license, site, etc., and quickly find the company user's information. You can decide what information to show on your report by selecting or clearing the check boxes of basic and advanced fields. You can simply find the field you are looking for through a search option To generate a users report, go to Home > Users, and click Generate users report. Support for automatic notification of service changes: When you assign a service to a contact (upgrade a contact to a user), or create a new user, the system automatically sends a welcome email to the user. 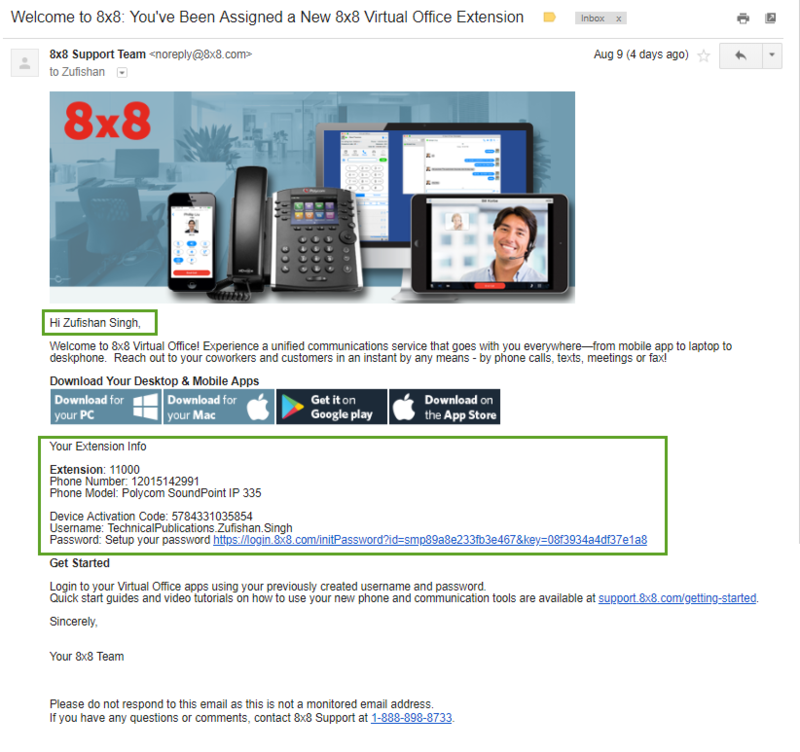 The welcome email includes the user's name, extension and phone number, the phone model, and more. 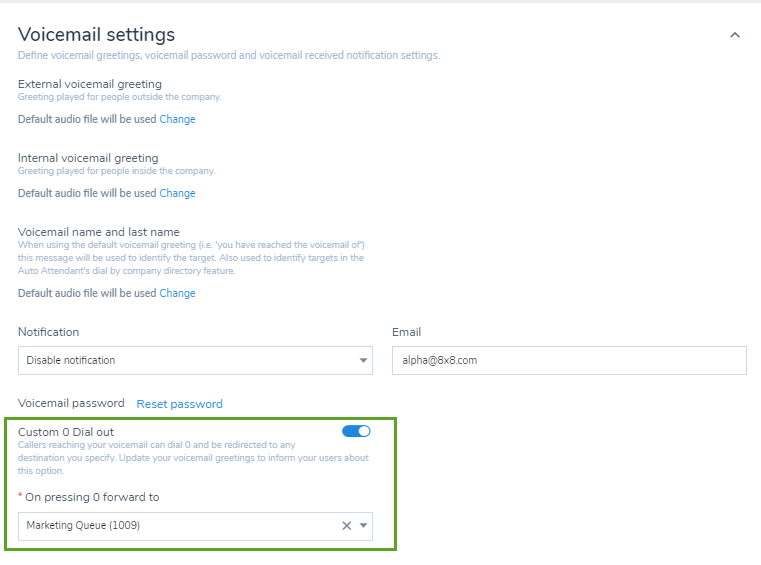 To disable the automatic email, go to Users > Onboarding information while editing a user, and disable the option to Send welcome email. 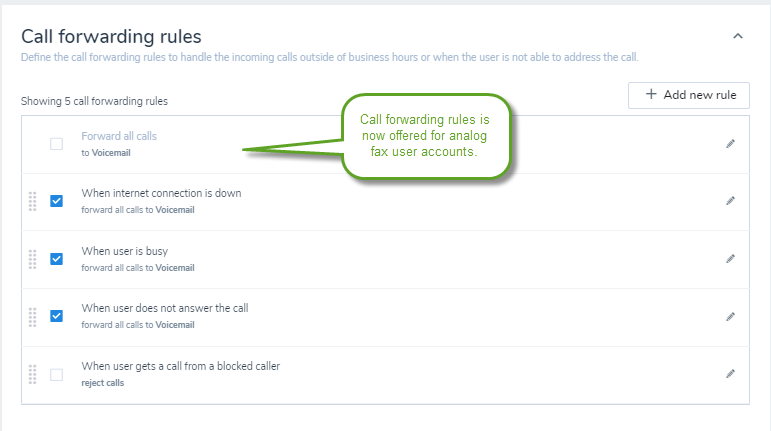 Support for custom destinations in call forwarding: You can now add custom destinations to user's call forwarding rules, allowing administrators to add targets, such as service extensions, to forward the calls to. Let's say you need your users to access the voicemail system by calling into a ring group. The ring group would then send calls to the voicemail system extension 500. By setting the custom destination 500 for the ring group service user, all calls will go to the voicemail as set up for the custom destination. To add a custom destination to your call forwarding, go to Users > Call forwarding rules and click to edit Forward all calls, add a custom number and save. 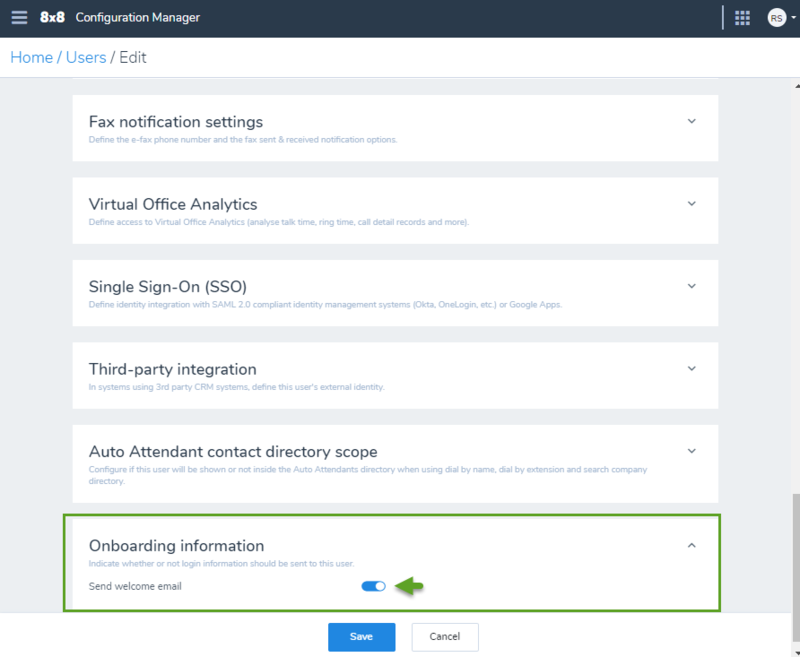 Ability for administrators to log in call queue members: Administrators can now log in call queue members to a queue involuntarily. Prior to this release, administrators could only log out the members from the queue. 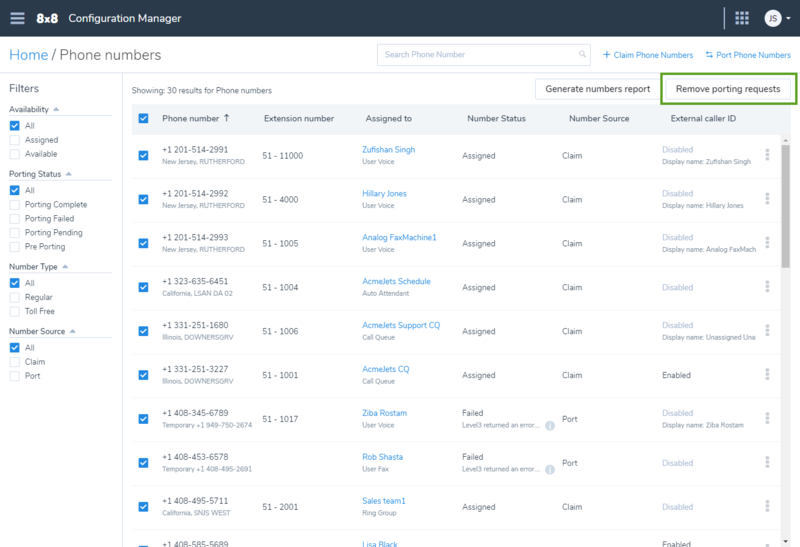 This feature can help administrators monitor the call queue and add members when needed. To log in members to call queues, go to Home > Work Groups > Call Queues and click Log in to queue. Support for Group Paging in Cisco phones: We now support group paging in Cisco phone models 7811, 7821, 8841, and 8861. Prior to this release Group paging support was limited to Polycom phones. Paging with Cisco phones requires the paging group to have at least one member with Receive option. The Send option is automatically disabled since group members must dial the group paging extension to page other members. To access group paging, go to Home > Paging and create or edit a group paging. See Create a Group Paging to learn how to configure Cisco phones. Limitation: Only emergency paging is supported in Cisco phones. Emergency paging interrupts the group members active calls. Ability to notify users via email when sending or receiving fax: You can choose whether a user receives email notifications when they send or receive a fax. The email notification is disabled by default, but you can configure it to be link-only, an attachment, or link and attachment. To set up the fax notification for a user, go to Home > Users > Fax notification settings. The updates are both ways, that is, the changes to Configuration Manager updates the user's settings in Virtual Office desktop app and the changes made by the user in Virtual Office desktop app updates the fax notification settings in Configuration Manager. 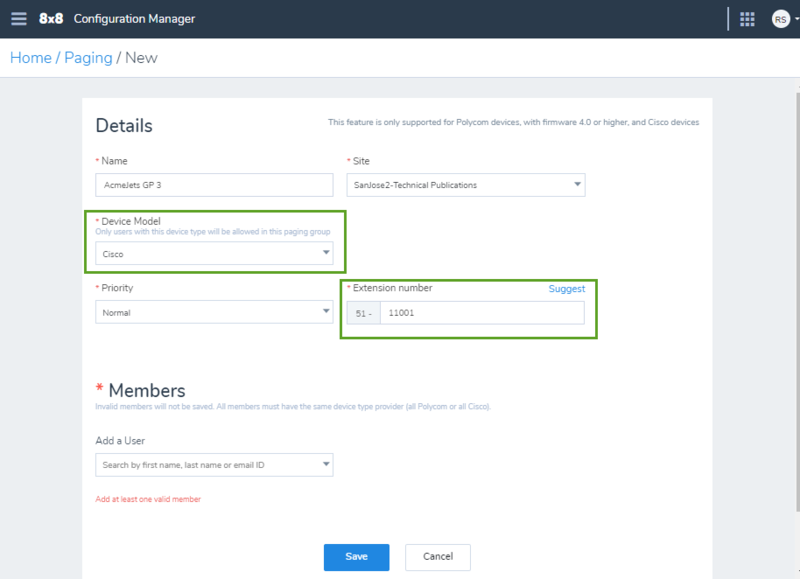 Removed Okta sync back information section from Single Sign-On: We removed Okta Sync Back Information section from Okta Single Sign-On page in Configuration Manager. 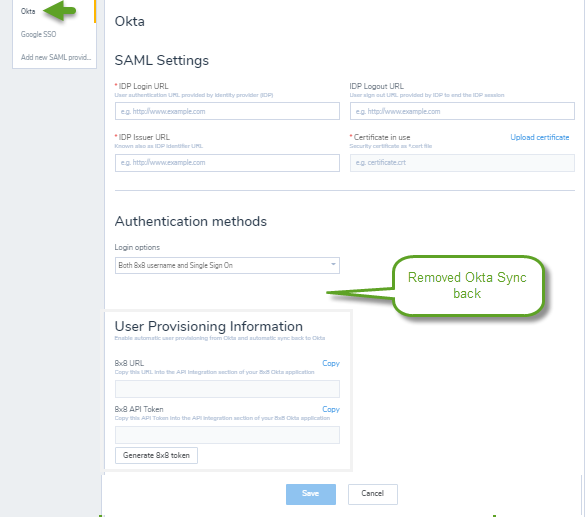 The sync back is now done automatically via Okta 8x8 application and no more configuration is required by the users. 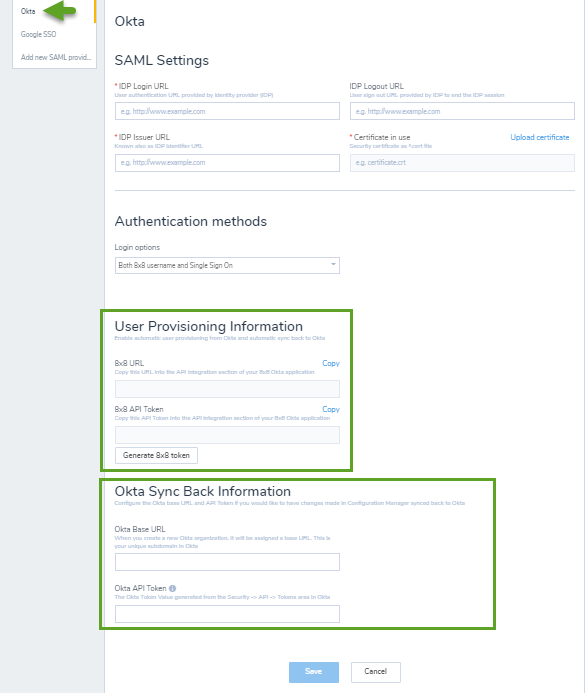 To access Okta configuration page, go to Identity Management > Okta. Refreshed new look for the Users page: The user data is now structured in collapsible sections, facilitating navigation and usability from desktop and mobile devices. To see our refreshed look, go to Home > Users and create or edit a user. Click to expand each section for further configuration. Ability to upgrade licenses via Users page: You can now properly upgrade a user license via user profile. A list of available and active licenses for the tenant are shown under Services and permissions. When a user has no license assigned, you can choose any license from the license drop-down. But when a user already has a license, only the licenses with more capabilities (upgrade) or with similar set of capabilities are shown. To upgrade a user license, go to Home > Users and while editing a user, click Services and permissions. Select a different license from drop-down, and click to save the user. If you already have a license and would like to add a second one, such as a Virtual Contact Center seat, click + next to the first license field to add a second field. Select the Virtual Contact Center license from the list. Click to save the user. Ability to hide a user from the company's directory: You can now hide users, rings groups, call queues, and auto attendants from publishing in the company's contact directory. If the display option is disabled, the user is no longer visible when searching for contacts. To hide a number, such as an internal fax number, from the company directory, go to Home > Users > Basic information and find the service user. Click to disable Display contact in company directory, and save. Ability to see a phone number's source: You can now see the source of phone numbers in your tenant. To see whether a number is claimed or ported, go to Home > Phone numbers and check out the Number Source column. Ability to access the pairing pin for DECT handsets via user profile: You can now see the pairing pin for DECT devices that have a base and a handset. To pair the handset to the base and activate the cordless IP DECT phones, you need a four-digit pairing pin. The pairing pin is displayed in the read-only field in Users > Voice basic settings for easier access and to facilitate the process. The pairing pin is also sent to the user via the welcome email. To access the pairing pin, while editing a user, go to Voice basic settings and select a DECT handset and base. Pairing PIN appears next to the Device model. See our knowledge base article: How do I activate my cordless IP DECT phones. Introducing power key templates: You can now save the power keys configuration on a device and copy it to other devices. Simply save the line key configuration as a template and import it to other devices. This saves time and effort in configuring the power keys on devices individually. To save a new template, while editing a user, go to Voice basic settings > Device model, and click Line key configuration. Configure the keys as needed, and click Save as template. The new template is added to your system. To import an existing template for a new user or device, while editing a user, go to Voice basic settings > Device model and click Line key configuration. Click Import from template. The template is imported for this user or device. Ability to remove porting orders: You can now remove your porting order for the numbers that failed to port or are still pending porting. It allows users to remove a failed order due to a mistake or incorrect number. When you remove the porting request, the number is removed from your system. The temporary numbers are either returned to 8x8, Inc.or will remain in your inventory as a claimed number. Go to Home > Phone numbers. Filter the numbers by the Porting Failed or Porting Pending status. Find the number you would like to remove and click . Select Remove porting request from the menu. The failed porting number will be removed from your system following a confirmation message. The temporary numbers can be kept in your inventory as claimed numbers. Ability to resubmit a porting order: If you are not happy with any number you have submitted, or if you need to change your order, you can simply make changes to your order and resubmit without going through the complete porting process. Be in a portable state such as pre-porting or failed stage. Keep at least one telephone number unchanged in an order with multiple porting numbers, or the order will be canceled. Enter the same type of numbers as the original order (for toll-free and wireless orders only). Do not change the service provider. Filter the numbers by Porting Failed or Porting Pending, and click next to a number. Edit the order number and click Continue. See Port your existing phone numbers. Ability to remove call park extensions: You can simply delete a call park extension, that you have no use for, from the list of extension numbers. When you delete a call park extension, the power keys pointing to the extension number become invalid. To delete a call park extension, open Extension numbers and find the call park extension to delete. Click , and select Delete. Ability to view port assignment for DECT bases and ATA terminals: You can now view the port assignments on a DECT base or an ATA terminal unit and inspect what ports are assigned to users. To see the port assignment on a DECT or ATA device, go to Home > Devices and click View device report. Click any device on the list to open the device's Info Panel. You can view the number of ports and the port assignments. 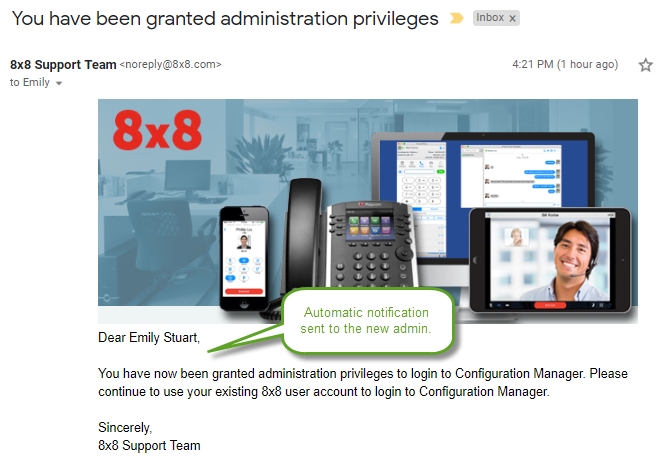 Ability to contact 8x8, Inc. Support directly from within the application: Users can now contact the support team at 8x8 directly from Configuration Manager. You can open and review your support cases, report operation issues, or ask questions regarding your system. This service only applies to 8x8 customers at this time. 8x8 Partners are excluded. To access support link, click Contact support from the top header. 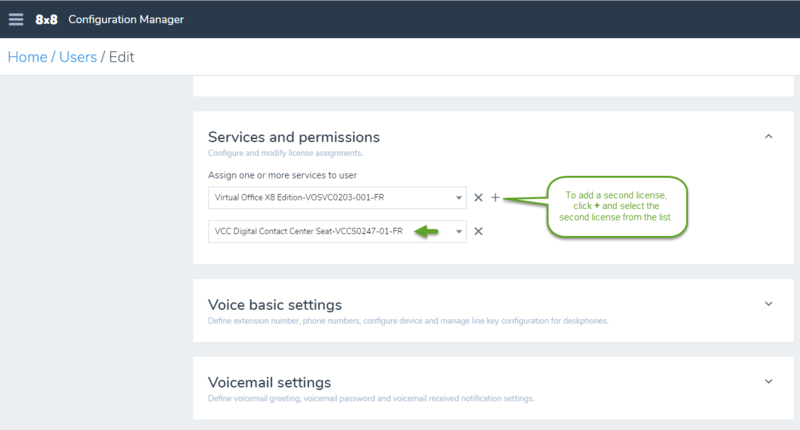 Ability to select a user's Virtual Office or Virtual Contact Center extension for BLF targets: When creating a BLF target, you can now select either VO or VCC extension for users who have both licenses. To add a new BLF key, click Line key configuration while editing the user. Click to add a BLF key and search for the user to monitor. Notice that you can see both user's extensions under User to monitor for the users who have both Virtual Office and Virtual Contact Center licenses. Ability to enter custom destinations for speed dial: You can now add custom numbers for speed dial. We provide support for +,-,*,# characters and digits. For example, for an international number, you can enter +985555555555. Notice that the label field matches the Dial to field. To add speed dial custom destinations, while editing a user, click Line key configuration > Speed dial > Dial to. Enter the custom number and click Save. Ability to filter sites on auto attendants page: Customers with multiple sites and a large number of auto attendants are now able to filter the auto attendants based on their sites. This enhancement helps them paginate and locate their auto attendants quickly. Go to Home > Auto Attendants and click to filter per site. 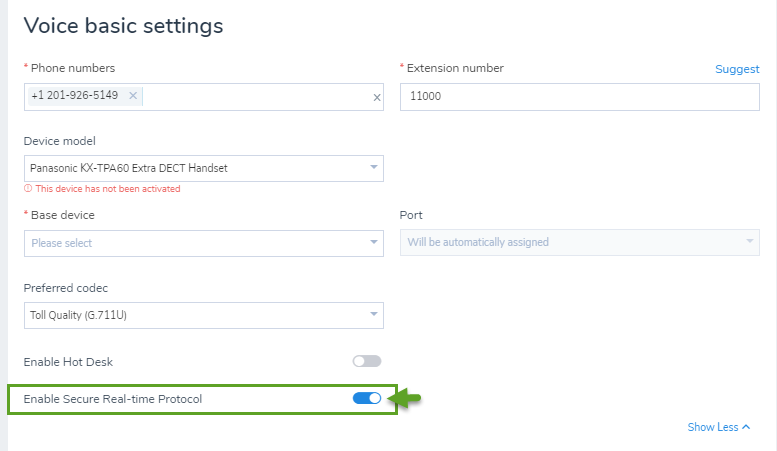 Ability to select DECT bases and ATA terminals on large accounts: You can now select the DECT base and ATA terminals in large account with more than 200 devices for better filtering. To select the DECT base and ATA terminal, the user must have a DECT or ATA device assigned. Go to Voice basic settings > Base device while editing the user and look to find a base or ATA terminal from the list. 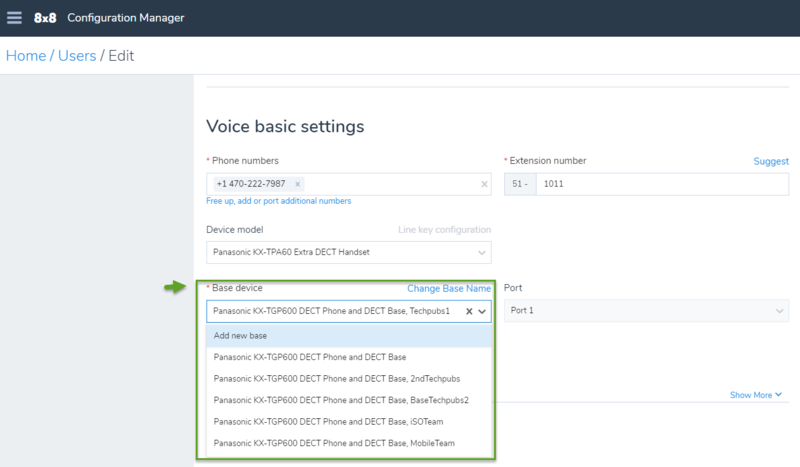 See how to assign DECT phone to users. 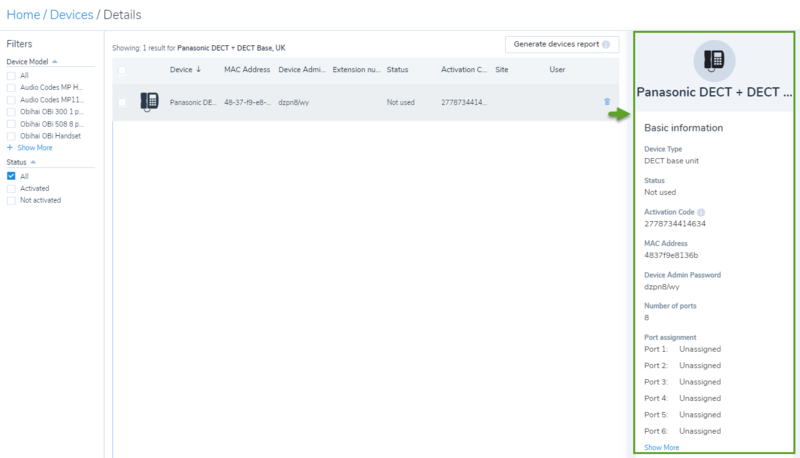 Enhanced visibility to device details: In the Devices page, we have introduced the Info Panel that presents the device information such as: device type, status, activation code, MAC address, and more. Info Panel allows a quick visibility to the device details. To access the Info Panel, go to Devices, and click view device report to open the Details page. In the Details page, click any device on the list to view the device details in the Info Panel. 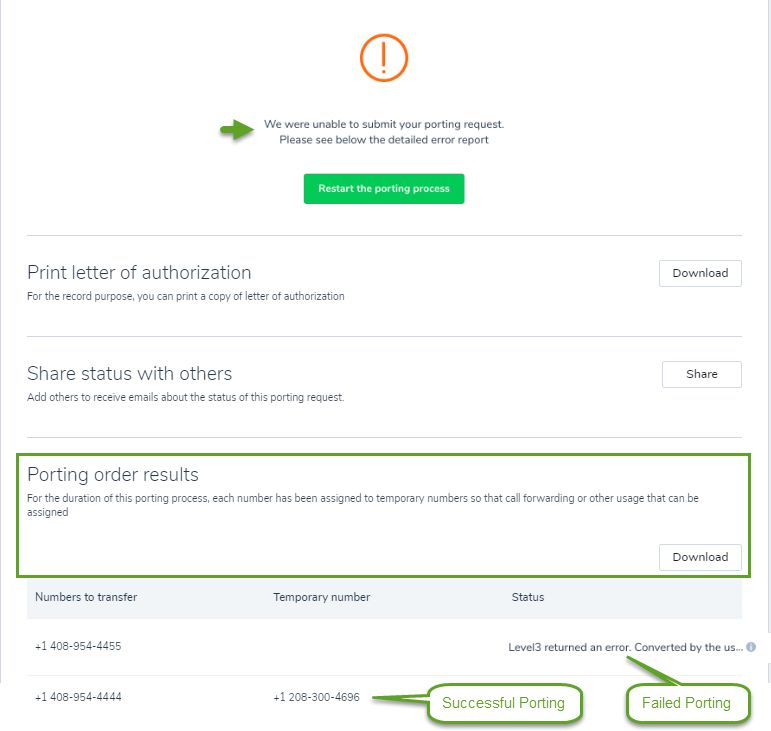 Improved notification for failed number porting: Upon submitting your porting request, we immediately notify you about the failed porting requests by showing the status and reason for failure. We provide a temporary number for each successfully ported number. 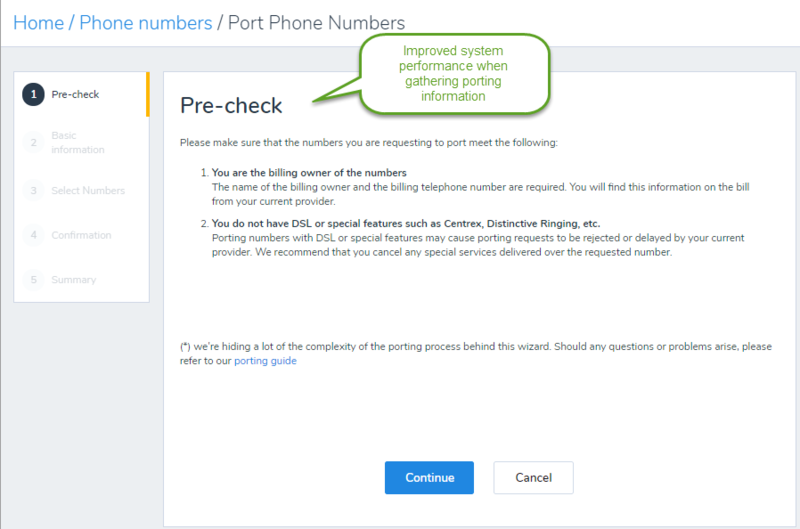 See the porting order results by going to Home > Phone numbers > Port Phone Numbers >Summary page. Resolve the issue and click Restart the porting process. Ability to disable Secure Real-time Protocol (SRTP) for Virtual Office users: Transport Layer Security (TLS) and Secure Real-time Transfer Protocol (SRTP) are standard protocol for securing VoIP traffic. SRTP is enabled by default for all devices. To disable the SRTP, while creating or editing a user, go to Home > Users > Voice Basic Settings. Make sure you have a device selected such as Polcom VVX 301. Disable Enable Secure Real-time Protocol and save the changes. 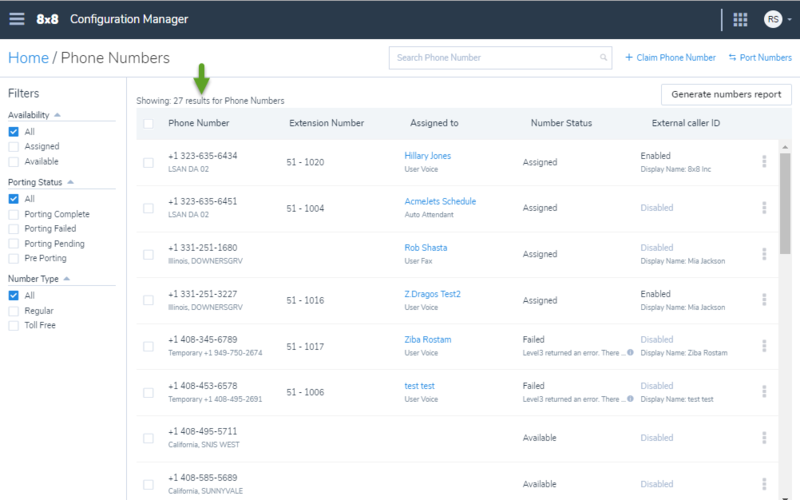 Enhance call forwarding rules: You can now forward incoming calls to voicemail, users, or numbers when a user does not answer the call. The call forwarding rule is automatically set to 15 seconds but allows you to change the duration. When creating or editing a user, open Users > Advanced Settings > Call Forwarding and edit the value for When user does not answer the call. Improved notifications for power keys in Polycom devices: In Polycom devices, in addition to the flashing red light phone notification, you can now enable call screen notifications and audio tone for power keys. If you enable call screen notification, full splash screen alerts you when an extension rings. If you enable call audio tone for incoming calls, you hear an audio tone when an extension rings. 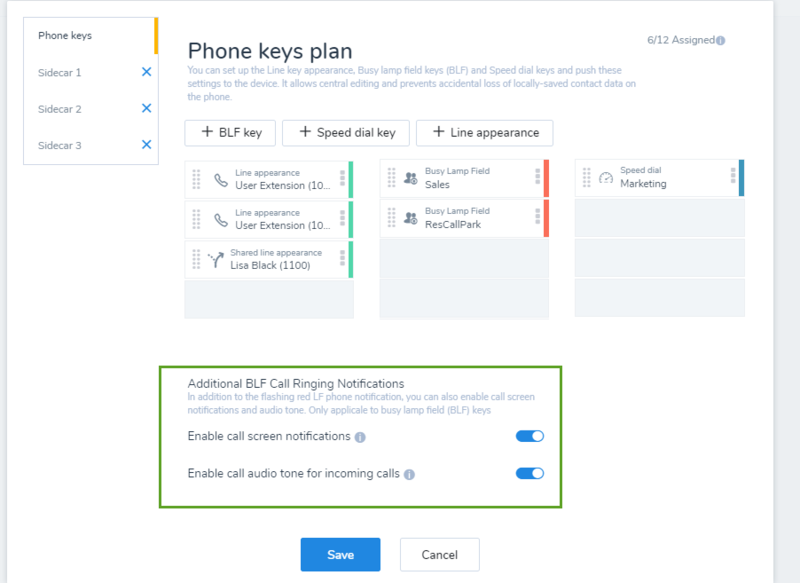 To enable notifications, while editing the users, go to Users > Voice Basic Settings > Line key configuration and enable options under Additional BLF Call Ringing Notifications. 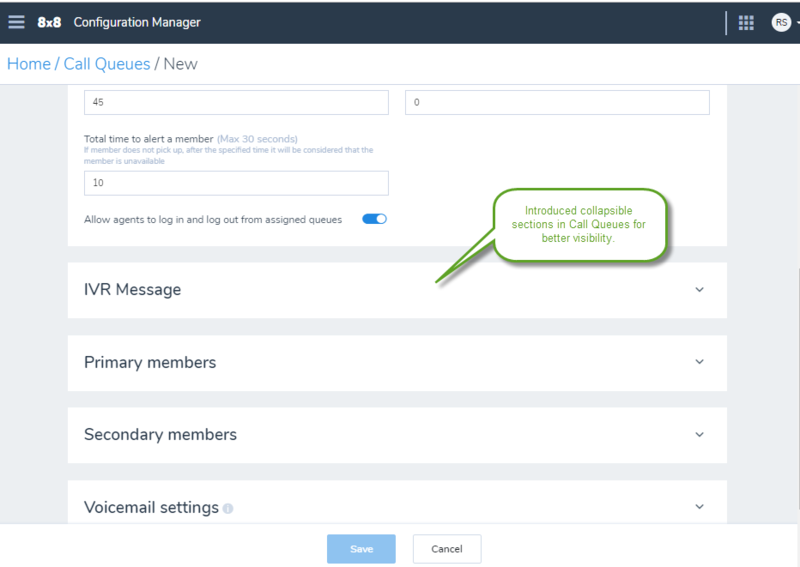 Enhanced call queues to alert members about incoming calls: We have now added a new setting to alert the call queue members about incoming calls. If a call queue member does not answer the call within the specified time (maximum 30 seconds), the user is considered unavailable and the call is moved to another member, or back to the queue. To enter alerting time for a member, go to Call Queues > Basic Information and enter a new time for Total time to alert a member. See Set up a call queue. 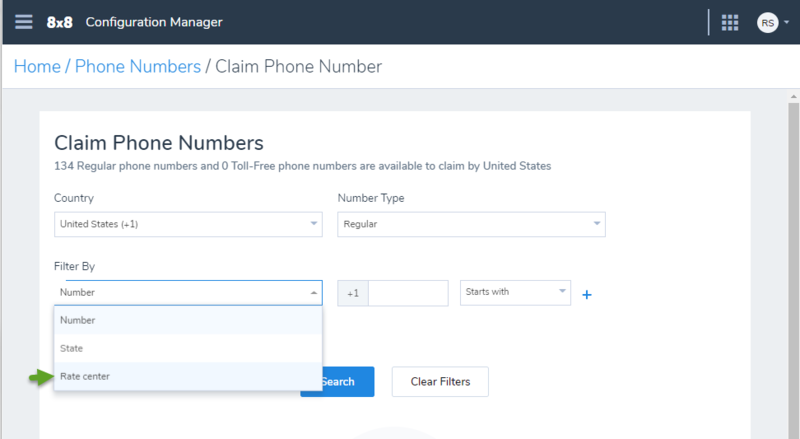 Ability to search and filter phone numbers by a rate center: While claiming a new phone number, you can filter and look for numbers by specific rate center. Rate center is a geographically-specified area used for determining mileage or usage dependent rates in the public switched telephone network. To filter by the rate center, go to Phone Numbers > Claim Phone Number and select Filter By > Rate center. Click Search to get the result. 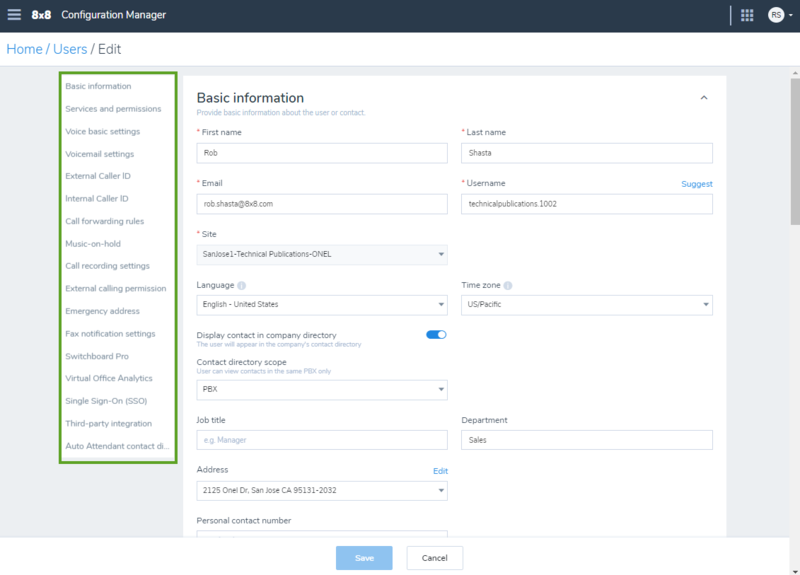 Improved Okta configuration page in Configuration Manager: We have now added helpful descriptions and decoupled two sections: User Provisioning Information and Okta Sync Back Information. 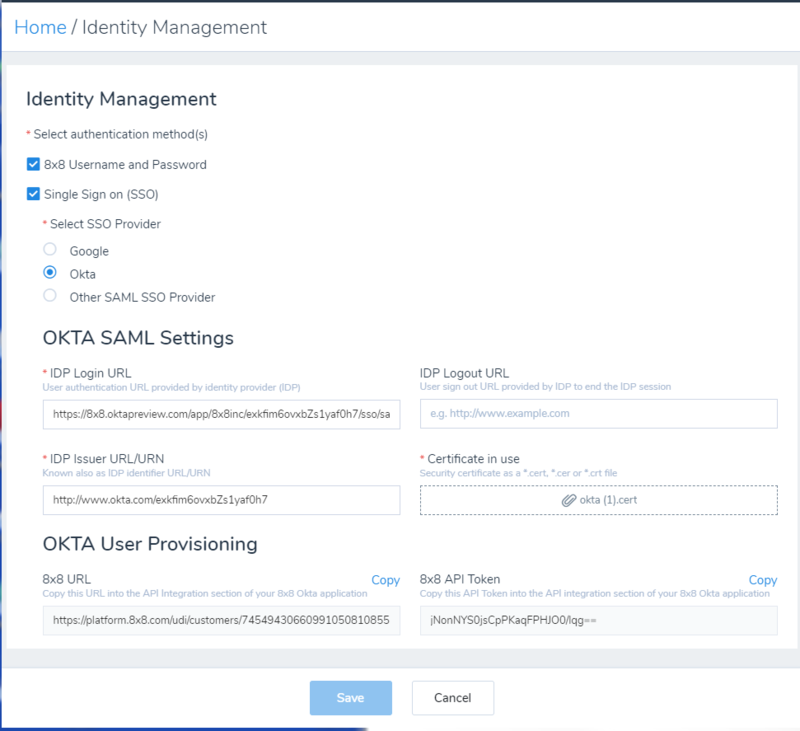 To access Okta configuration page, go to Identity Management > Okta. Enhanced ring group configuration: We have added pagination for ring group filters. The ring group name and extension is now set as default for the ring group caller ID. To access the ring group caller ID, go to Ring Groups > Ring Group Caller ID and choose or change the default. Ability to generate a phone number report: You can now generate a report that lists all phone numbers, assigned or available in your phone system. Find out the list of ported numbers, or numbers that are pending porting, or those that have failed porting by using the relevant filters. The report includes the phone number, type, location, extension, and more. To generate numbers report, go to Phone Numbers, set a desired filter, and click Generate numbers report. Improved sorting of phone numbers: Phone numbers now appear in an ascending order helping you to locate a number easier. To see the list of phone numbers, go to Home > Phone Numbers. The sort order cannot be changed. Added support for additional countries: You can now add addresses from a wide range of countries such as: Anguilla, Barbados, Bahrain, Brazil, Bahamas, and more. To see the complete list of countries, see Appendix A. To create or edit an address, go to Users > Basic Information > Address, and select New Address from the list. The list of countries can be also accessed from site address, emergency address, porting process, and number claim.